The meeting started with two announcements the Vice-Chair (Councillor Prendergast) wished to make. The first was he asked for the noisy tea urn at the back of the room to be switched off as he said he had hearing problems. The second announcement Councillor Frank Prendergast (Labour, Liverpool City Council) wanted to make was to say that a request was made to film the public meeting of the Merseyside Police and Crime Panel which he had turned down because “confidential” things may be said during the meeting. However he said the public were welcome to stay for the whole meeting. He replied that he was. None of the other three Labour councillors present said anything at this point, nor was a vote taken. I asked the Chair at the close of the meeting to provide a quote as to why he’d been against the public meeting being filmed. He told me he was too busy to provide a quote as he had to leave (the meeting was held in Birkenhead) to go to Clatterbridge via Liverpool. Although the Openness of Local Government Bodies Regulations 2014 which prevent bodies such as the Police and Crime Panel stopping filming of their public meetings have been laid before the House of Commons on the 3rd April 2014 by the Rt Hon Eric Pickles MP, due to Parliament breaking up for Easter a week later a resolution approving the Openness of Local Government Bodies Regulations 2014 hasn’t yet been passed by the House of Commons and House of Lords. So it doesn’t yet have the force of law. The Merseyside Police and Crime Panel is a joint committee of the councils on Merseyside. The new Labour chaired Liverpool City Region Authority also declined a request to film their first public meeting. The Liverpool City Region Authority’s constitution delegated such matters to the Chief Executive of Knowsley Metropolitan Borough Council Sheena Ramsey. 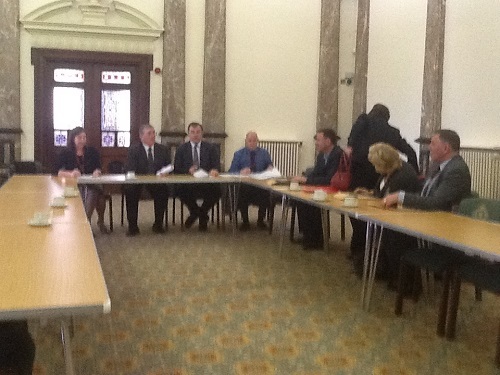 Knowsley Metropolitan Borough Council is also the host authority for the Merseyside Police and Crime Panel. Has the message from Labour’s front bench spokesperson Hilary Benn MP to “support the change” to “allow the recording and videoing of council and committee meetings” fallen on deaf ears? Do the four Labour councillors who made the decision to prevent filming yesterday (Councillor Frank Prendergast, Councillor Doreen Kerrigan, Councillor Peter Brennan and Councillor Moira McLaughlin (who is currently Labour’s candidate in Rock Ferry ward)) realise how strange it seems for their party’s national spokesperson to say one thing yet Labour councillors locally on Merseyside to do the complete opposite? My comments on what happened are that currently the public (and press) already do have the right to film, blog and tweet at public meetings. This is granted to them by article 10 (freedom of expression) of the Human Rights Act 1998 c.42. It is unlawful for any public body to act in a way that is incompatible with article 10 (freedom of expression) due to section 6 of the Human Rights Act 1998. In an ironic twist the Merseyside Police and Crime panel during the meeting discussed the wearing of cameras in public by police officers and were supportive of it. « How much will Wirral Council have to pay B&M Retail Limited to settle an outstanding compensation claim? McLaughlin yet again. When can we finally consign such people to an abusive, poisonous, bygone age? OH, the people of Rock Ferry can do that in May, can’t they? As you point out it is up to the electors in Rock Ferry to choose who they want to represent them as their local councillor on Wirral Council in the upcoming local elections. In the interests of balance I will list the five candidates currently standing to be a councillor in Rock Ferry ward here (in alphabetical order by surname): Ann Flynn (UK Independence Party), Brian Joseph Hall (Liberal Democrat), Moira McLaughlin (Labour Party), Barbara Frances Poole (Conservative Party) and James Kenneth Pritchard (Independent). I’ve published the full list of candidates at Who are the 113 candidates in the 2014 Wirral Council elections?. There is an independent candidate standing in Seacombe this year who I think you met at the Improvement Board last November? What was said at this public meeting regarding the Big, ISUS and Working Neighbourhoods crimes after me blowing the whistle 1,025 days earlier? Nothing whatsoever. The panel invited the Police and Crime Commissioner to the meeting, but she wasn’t there. Neither were any police officers. There was a long discussion on “take effective action against all forms of hate crime” though. So unless the BIG/ISUS issues were connected with where you were born there was no discussion at all about it. Even if they wanted to discuss individual cases the law states those sort of things are “operational” matters for the police and not the sort of thing that politicians can meddle in as the legal responsibilities for that side of things rest with the Chief Constable. The Police and Crime Commissioner holds the Chief Constable to account and the Police and Crime Panel hold the Police and Crime Commissioner to account. At least that’s how it’s supposed to work in theory.